“Narrow Path” from Christian Faith Publishing author Myra N. Ray is an inspiring memoir that conveys a message of faith through internalizing the Holy Word of God. “Narrow Path”: a potent account that recounts the author’s personal struggles in life and how she overcame them through the grace and guidance of God. “Narrow Path” is the creation of published author, Myra N. Ray, a strong and resilient woman and a firm believer in God. Published by Christian Faith Publishing, Myra N. Ray’s new book is a proclamation a woman’s unequivocal trust and unyielding faith in God’s love and mercy. Readers will get to witness God’s working hand in the life of a profound woman as she imparts the significance of receiving his covenant in the person of his son, Jesus Christ. View a synopsis of “Narrow Path” on YouTube. Consumers can purchase “Narrow Path” at traditional brick & mortar bookstores, or online at Amazon.com, Apple iTunes store, or Barnes and Noble. 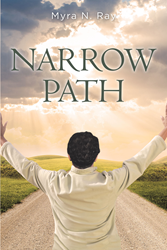 For additional information or inquiries about “Narrow Path”, contact the Christian Faith Publishing media department at 866-554-0919.